National Puzzle Day Puzzle Hunt Solution! Last Monday was National Puzzle Day, so to honor one of the puzzliest days of the year, we celebrated with not only giveaways galore, but a special online puzzle hunt as well! And today, we’ve got the solution to the multi-stage puzzle that awaited solvers that day! Enjoy! 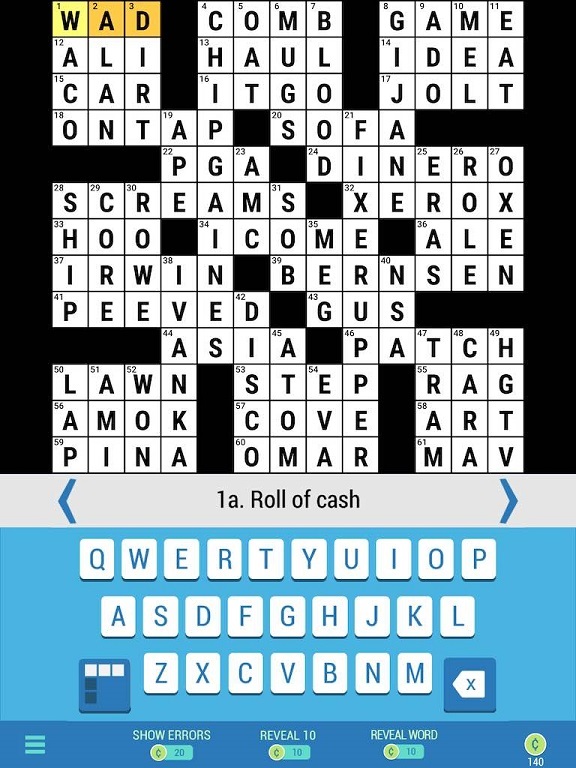 Step 1 started with a Carry-Over puzzle where answers from that day’s free Daily POP Crosswords puzzle were plugged into a chain of escalating anagrams. 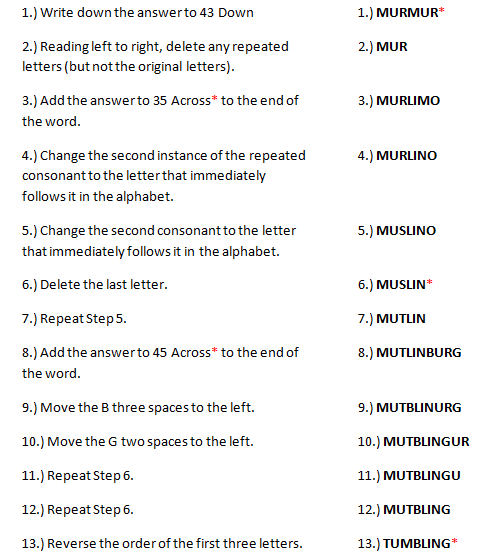 As each word was anagrammed into a new word that fit the given clue, letters were subtracted and added to the next word down, giving the solver a larger pool of letters to work with to answer the next clue in the chain, and so on. And when solvers plugged the answer “acrobat” into the link on the page, it took them to a hidden page on the PuzzleNation Blog website, where Step 2 awaited them. Step 2 challenged solvers to complete a series of tasks in a game of Simon Says. 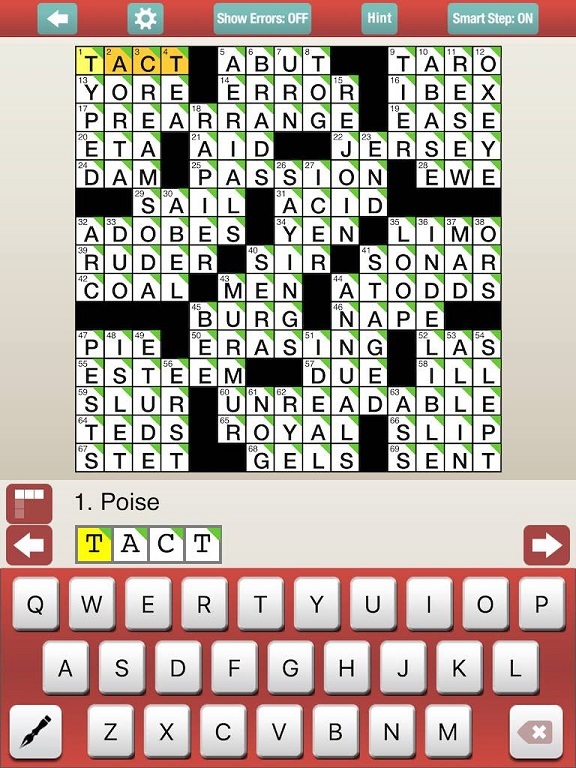 But before they could start, they had to plug in answers from that day’s Penny Dell Crosswords App free daily puzzle. 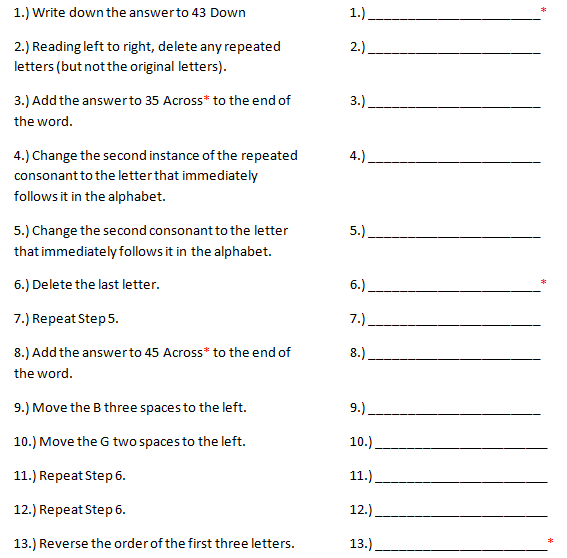 With the answers handy, they could begin following the instructions and transforming the initial answer word into something unexpected. And when solvers plugged the answer “tumbling” into the link on the page, it took them to a hidden page on the PuzzleNation Blog website, where Step 3 awaited them. Step 3 marked the final leg of the puzzle hunt. But to complete it, solvers had to pay attention to all of those red asterisks in the first two legs of the puzzle. 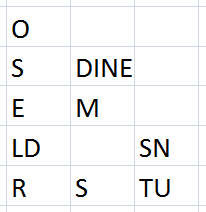 There were fifteen of them, between answer words and grid words, for solvers to arrange alphabetically into three columns of five words apiece. Solvers then had to read across each row of words and cross off every letter that appears twice or four times in that row. 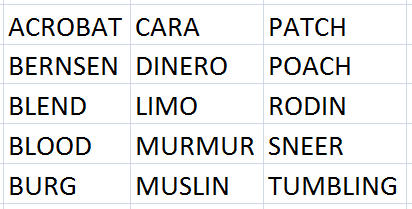 Then, reading down, do the same in each column of words. Once a letter is crossed off, it cannot be part of another pair or foursome. 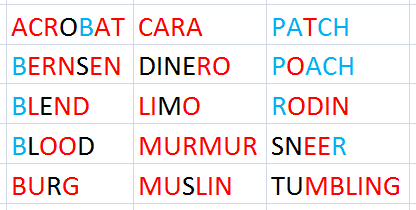 The pairs/foursomes across are highlighted in red and the pairs/foursomes down are highlighted in blue, with only the black letters remaining. Those five words are DINERO, LIMO, MUSLIN, RODIN, and SNEER. 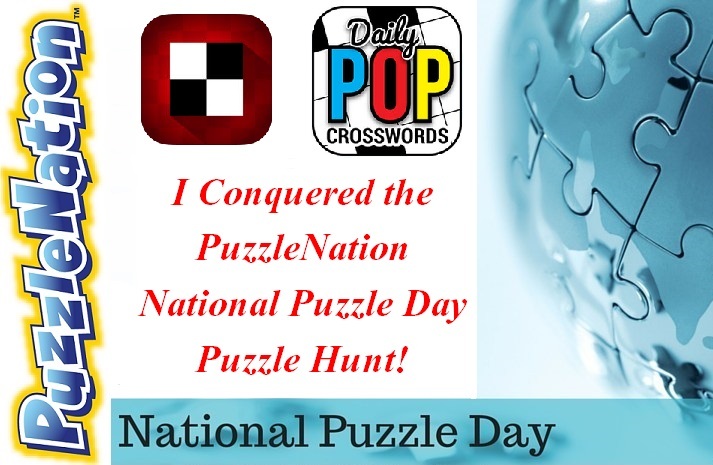 Solvers who completed the puzzle hunt also earned 100 coins for the Daily POP Crosswords app! A hearty thank you to everyone who participated! We hope you enjoyed this puzzly challenge! This entry was posted in PuzzleNation, Puzzles and tagged anagram, carry-overs, Cluing, crossword, crosswords, Daily Pop, daily pop crosswords, daily pop crosswords app, DIY puzzling, Geeking Out, Holidays, International Puzzle Day, National Puzzle Day, online puzzle, online puzzle hunt, Penny Dell Crossword App, Penny Dell Crosswords App, Penny Dell Puzzles, Penny Press, Penny/Dell Puzzles, Pop culture, puzzle challenge, puzzle day, puzzle hunt, PuzzleNation, Puzzlin' fool, Simon Says, two-step, Wordplay by gmdirect. Bookmark the permalink.